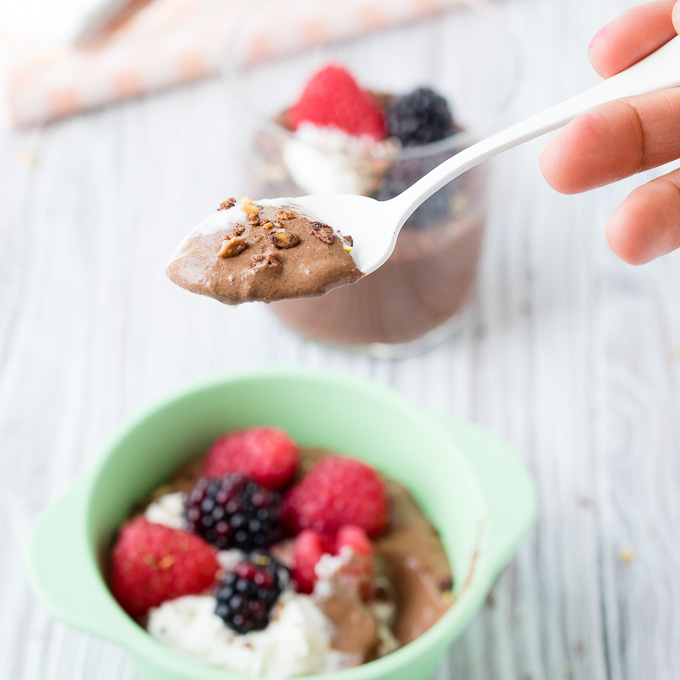 This chia seed pudding is actually the kid and toddler-friendly version of my Healthy Chocolate Chia Pudding, with a few tweaks so it truly is a healthy breakfast for kids. And fortunately, my toddler loves this healthy breakfast, and will even ask for it for dessert! 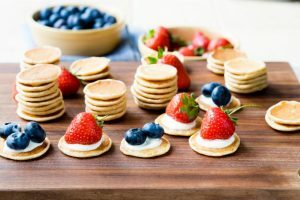 It’s a great healthy breakfast idea for kids, but it also works as a fun healthy snack, as well as a healthy dessert. 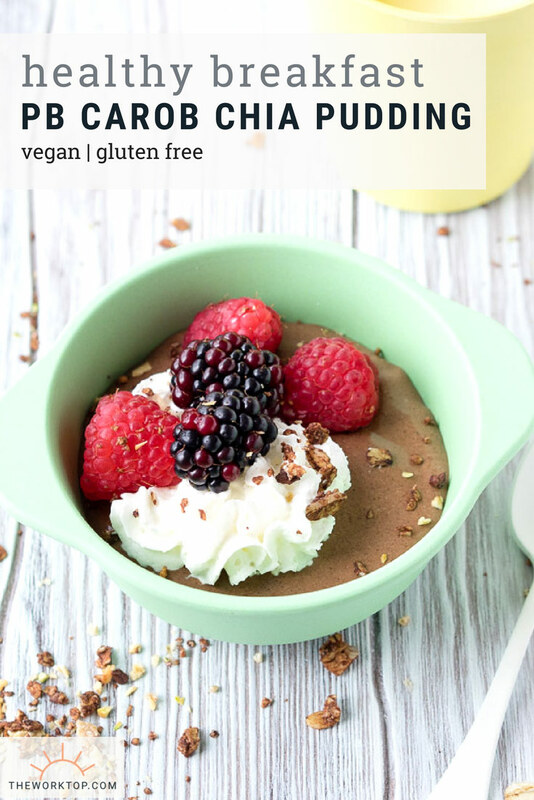 To make this chia pudding a easy breakfast for kids and toddlers, instead of chocolate, I use carob. Why carob? Because carob powder is packed with lots of antioxidants, and more importantly, is caffeine-free. The last thing I want is having my toddler buzzing around with an extra dose of energy from the caffeine in chocolate. I assume all parents would feel the same way! Since I’ve made this recipe so many times, my toddler now knows it’s called “carob”, and he will pull out the bag of carob powder we keep in the cupboard when he wants some of this chia seed pudding. But in the beginning, carob and chocolate was one and the same to him. As mentioned in my Healthy Chocolate Chia Pudding post, you can leave the chia seeds whole, but I definitely prefer to blend it for my toddler. 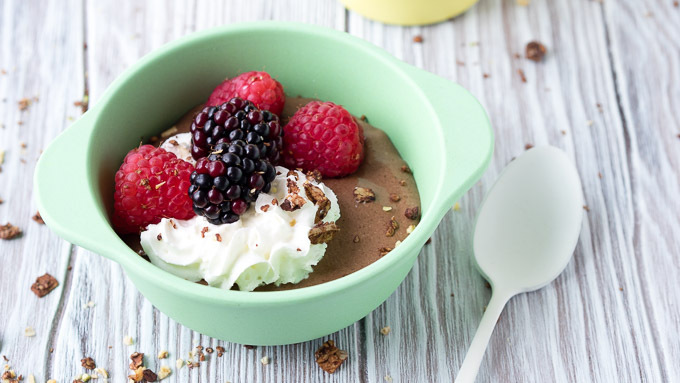 Doing so will give you a chia seed pudding that is a smoother texture, and more mousse-like. Blended chia seeds are also easier for my toddler to get on the spoon and feed himself. It’s not as gloopy, and it coats the top and bottom of the spoon, if that makes sense, so he can get a bigger bite in each time. 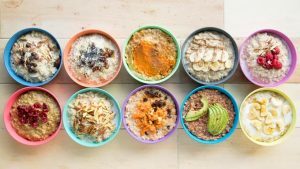 Regardless of whether the chia seeds are mixed or blended, chia seed pudding in general is a great breakfast (or snack or dessert) for kids and toddlers because it’s healthy and well, they eat it (at least mine does!). The chia seeds are loaded with fiber, antioxidants, iron, calcium, protein, and omega-3s. This is particularly important for toddlers who cannot tolerate dairy, eggs, or other nutrient-rich foods. Are chia seeds safe for kids and toddlers? I do want to highlight that some sites warn you should slowly increase chia seed consumption in toddlers. I personally wouldn’t feel comfortable making this recipe for a younger toddler or baby, as their digestive system might require food that is easier to digest. As always, with any medical dietary concerns or questions, please consult with your pediatrician. You can find advice online that ranges from feeding babies chia as young as 8 months to advice suggesting one wait until the toddler is 3 years old. 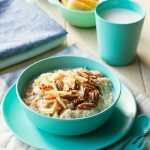 Because I’m a cautious mom when it comes to feeding my family and taking care of my toddler’s digestive track, we don’t eat this healthy breakfast on a daily basis even with all the health benefits of chia seeds. We personally started introducing chia seeds when he was about 1, and we slowly worked up to a bowl of chia pudding. Now, I keep this PB Carob Chia Seed Pudding on the rotation of our “my kid loves this breakfast” list. 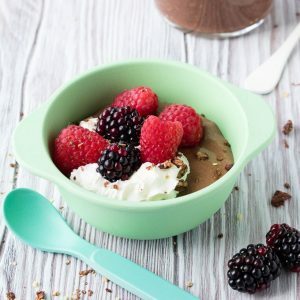 To make it as “dessert-like” as possible, you can top this chia pudding off with a dollop of whipped cream (or for little ones intolerant to dairy, you can try whipping up some coconut cream). But depending on what level of sweetness your toddler or child is used to, you could instead add some yogurt and fresh berries or bananas to this chia pudding. While yogurt might not be classed as a dessert to some toddlers, fortunately for me, mine funnily thinks its a real treat! 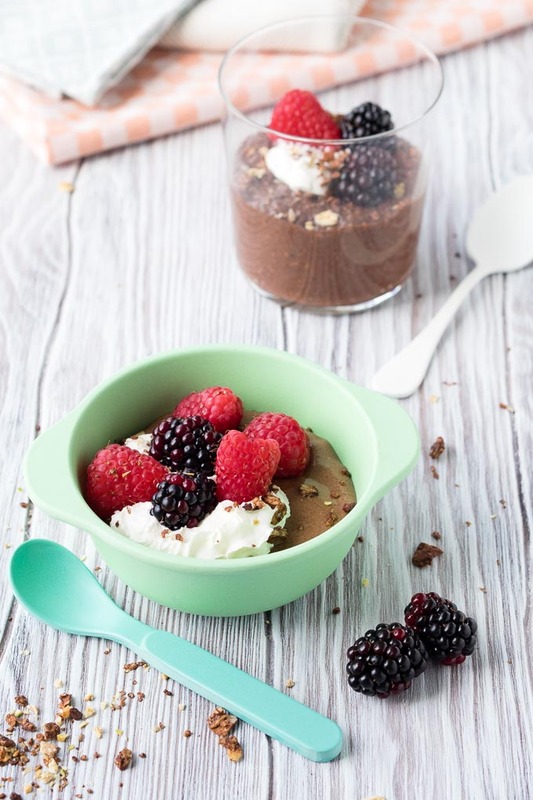 We often just serve this chia pudding with a big dollop of plain yogurt and fresh berries. 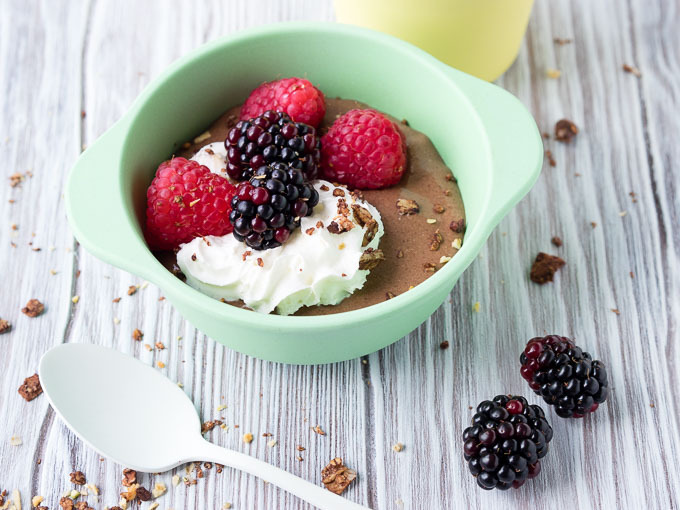 The original healthy chocolate chia pudding recipe that this toddler-version is adapted from uses almond butter instead of peanut butter. 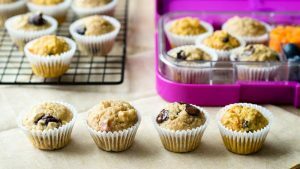 You can use either or, so stick with your kid’s favorite nut butter. A dose of almond butter or peanut butter will provide protein, vitamins and minerals. We swap it around, depending on what we have in the cupboard. But if you had to make me choose, I like carob with the peanut butter just a tad better. 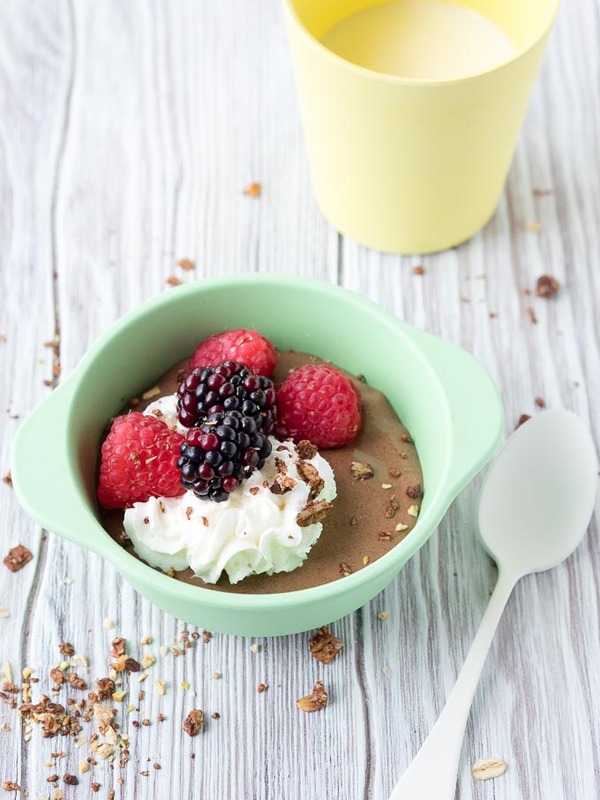 This PB Carob Chia Seed Pudding is a healthy breakfast idea for kids and toddlers. Mine loves it! 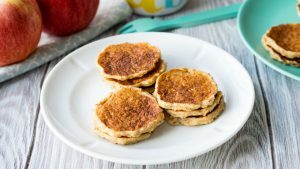 This easy to make breakfast recipe can be a fun and healthy snack or dessert too. It's a great way to get chia seeds in your toddler's or kid's diet. In a bowl, mix together the chia seeds, milk, carob powder, and maple syrup. Cover and set in the refrigerator to chill overnight. In the morning, add in the peanut butter and blend everything together until smooth. I use a stick blender for this. Alternatively, you can add in the peanut butter and mix it all together with a spoon. 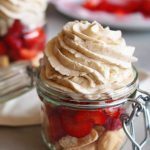 Top with fresh berries and yogurt or whipped cream. As always, with any medical dietary concerns or questions, please consult with your pediatrician. 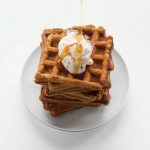 One little "trick" I've been doing when making this recipe is leaving the sweet ingredients (the maple syrup) out of the main recipe, and adding it in at the end with him watching. We squeeze it on together because, even at such a young age, he's learned that maple syrup makes everything better. 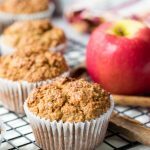 Looking for Healthy Toddler Breakfast Ideas? See more recipes!